The Daily Mail offers a piece that identifies the Russian hitman in London as a GRU colonel. The smirking Salisbury hitman wanted for poisoning Sergei Skripal has been unmasked as a decorated GRU colonel who was awarded Russian military's highest honour by Vladimir Putin after his service in Chechnya and Ukraine. 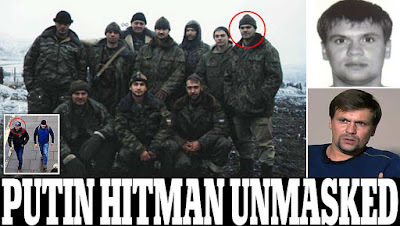 The real identity of one of the two assassins, identified by police as Ruslan Boshirov, is reportedly Colonel Anatoliy Vladimirovich Chepiga, 39. He was made a Hero of the Russian Federation by decree of the president during a secret ceremony in 2014. The disclosure, uncovered by investigative journalist organisation Bellingcat in conjunction with The Telegraph, exposes as lies Putin's claims that the Skripals' would-be killers were innocent 'civilians'.